This coffee will be fresh roasted for you. We expect La Colombe will roast and ship this coffee in 1-2 business days depending on their roasting schedule. This is the Ethiopia YirgZ brought to you by La Colombe. Ethiopian coffees from the Yirgacheffe region are world-renowned for producing distinctively floral and aromatic coffee. "Zero defect" means this coffee is triple sorted by size, color, and density until it reaches a point of near perfection. This fully washed coffee was grown at an altitude of 1,850 - 2,100 meters and consisted of Ethiopian heirloom varieties. 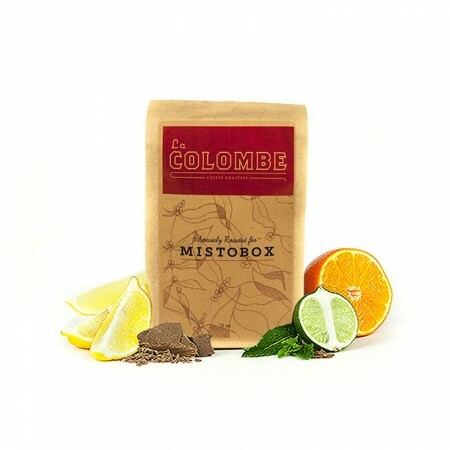 This coffee is bright with a mix of peach, lemon zest and vanilla notes. This was a great coffee. Really neat. I loved this. Wow. Mistobox continues to impress me. Keeping in mind that this coffee was picked for my particular taste, I still have to say this is some of the best I've ever hard. The fruity and bright combo of flavors really resonate with me, and I feel like the overall quality of this bean is phenomenal. I waited for several days to write this so I could try this coffee multiple times in order to give it the fairest review I could, but the number one quality that sticks out to me is how smooth this coffee drinks. I brewed it with a V60, and the flavors are so pleasing and not harsh in any way that I could drink this coffee by the liter. It does have a notable citrus characteristic as well, so keep that in mind if you get this. But I'd give it more than 5 stars if I could. I brewed this coffee in a clever dripper. The coffee wasn't bitter, but had a very strong taste upon first sip. It smelled more like a tea than a coffee. The beans were fresh ground, but the coffee tasted old and stale (tasting like eating old coffee grounds). The aftertaste lingered. I will try this again with a different brew method, but not my favorite! UPDATE: I brewed this in a "regular" coffee maker. The taste was a lot more pure, but still seemed more tea-ish than coffee (although more fresh). I wasn't blown away by this coffee, It may have been the citrus notes that I wasn't a huge fan of, but I'm glad that (I think) I was able to pick up on the notes, particularly lemon. My friend also subscribes to Mistobox and was able to try a cup of one of his the other day. This coffee, from Tandem Coffee Roasters (Aricha) was THE BEST cup of coffee I have ever had. It had a distinct blueberry note. I would love to have this coffee or coffees like this. I liked this coffee slightly less then the last one. It has great flavor but is almost too smooth and not quite bold enough. It has to cool down a bit before I feel like I can really taste it. Excellent - liked it better than the first. Thought flavor was more complex and roast level was right where I like it. Liked the citrus and herbal notes - wouldn't mind trying something with some spicy flavor to it as well. Great overall coffee, pleasant, and give off a wonderful aroma. Yirgacheffe region coffee is usually some of my favorites. This was an okay YirgZ. I could taste the citrus for sure but it lacked the vanilla flavor that I was hoping to pull out of it which made the coffee lack some flavor. I do enjoy this coffee though, I just think it lacked a bit of flavor. I have not tried it in the aeropress yet; so, I will do that probably in the next couple of days to see what I can pull from it. I thought this was pretty delicious and actually picked up on the peach note at times. I may be finding that I prefer a lighter roast coffee. I kept wanting to taste more of the coffee notes and couldn't find them over the roast, which I did think was really excellently done, but prefer peach and vanilla flavors. I think this is simply me finding my preferences. This coffee keeps growing on me though. Very clean and bright. I usually don't choose beans with citrus flavors b/c I don't like it when its too acidic. But this was a pleasant surprise. I've had the zero defect Yirgacheffe from a few different roasters and it has been stellar every time. La Colombe lives up to its reputation with a perfect rendition of this bean. In my cup the citrus notes are touch and go at the forefront, quickly making way for a honey like sweetness and a long vanilla finish. Delicious and I'll be sad to see the bottom of this bag! Balanced flavor, not too bitter or heavy. This coffee is very good flavor notes are on par. I would like to try a bit darker if a roast this roast was very light. WHAT A TREAT! I'm from philly and this is my faveorite coffee company. What a wonderful surprise. Delicious, great oils, great aroma, great memories! Brewed on a chemex. Very bright palette devoid of any earthy undertones. Refreshing. More of a summer coffee. Bright but not too acidic on the back end. Really good. We liked this one. We seem to like bolder and darker roasts. The brightness and acidity in this coffee was interesting but not fully our preference. Very good. Easy to drink, nice and light. Ric Flair in a cup. Woo! Nice -- less berry/wine flavor than a lot of East African coffees. Great coffee. I shared more of it than I drank. All consumers were delighted. All I remember from this bean was that I haven't had a cup from it at which I frowned. It was enjoyed each brew, and I would be happy having this bean in my cup again. Bit disappointed in this one. Came out flat, light, and without a ton of character. Really tasty coffee!! Very tea like and amazing to drink black. Was wonderful prepared with french press and chemex . Looking forward to trying it with milk and also preparing it with a stove top moka pot.Very bright with a nice finish. Amazing coffee! Mellow light lemon rind with a dash of vanilla to soften the acidity. It slowly transitions beautifly into a peach black tea like finish. Refreshing and satiating! What a great light-tasting coffee. I almost want to use the descriptor even-toned? I know it's a music term, but it's as if the flavor of this coffee is clear from the very first sip to the last. So it's a little surprising to me that there isn't a different aftertaste.I tend not to gravitate towards coffee beans with "floral" descriptors, but if this is what I can expect, I definitely have to change my tune. Very light and very, very good. Great light flavor - brewed in French press. Wonderful cold.